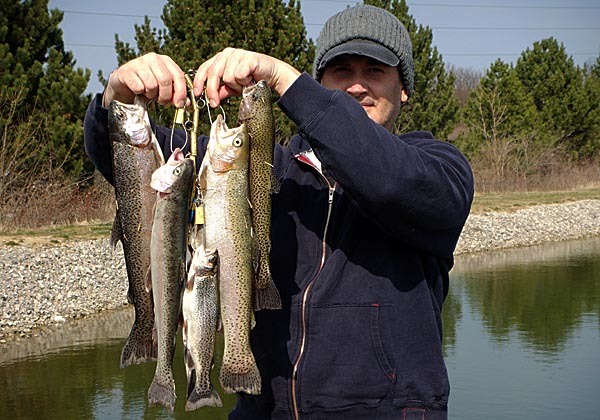 I owe a debt of gratitude to my friend Darrin for giving me a heads up about an Erie Metroparks Trout Derby. The ODNR does a lot of them and I often attend, but this was my first time doing one sponsored by a different agency. It is always nice to do a bit of guilt free harvesting as these events are clearly intended as ‘put & take’. Being that this wasn’t the ODNR, I was curious if it would still be the same Rainbow Trout in the 10-13″ range. While there were plenty in that range, the pleasant surprise was the amount of larger fish mixed in. I had never been to a small water trout stocking with at least half of the fish being 16-22″. Darrin, his son Leo and I, had a blast catching loads of fish. We also made sure to help others, especially the kids. While I know there are some purists who really hate these type of stocking events, they are fun and I always see a lot of children at them. I have to believe that these events might help ‘springboard’ a youngster into a lifetime of fishing. (L to R) I often do not bring a net to trout stocking events like this, fortunately Darrin and Leo brought one. Look at how that fish fills the net, certainly not your average class of fish. To the right, a nice example of the quality fish that were stocked. This fish was my largest at 22″. « Grass Carp added to life list!